Last week, I went home to Michigan for a lazy (but much needed) spring break. On an afternoon shopping excursion, I mentioned to my grandmother that I always keep an eye out for cast iron cookware in thrift stores. Over the years, my husband has given me several pieces of beautiful Le Creuset enameled cast iron cookware, but I needed a good, old-fashioned skillet. A heavy, blackened, well-worn pan like the one I remember my Grandma S. frying chicken in for Sunday dinners when I was younger. My grandma told me she would try to dig out my great-great-grandmother's cast iron. I should have known that I wouldn't be disappointed. My grandparents' house has everything. That random, oddball thing that you might need once in a decade? They've got it. School assignments. Craft projects. Science experiments. I cannot think of one instance when I needed something and my grandparents either didn't have it or couldn't think of a better alternative. Cast iron, it turns out, was no exception. So, I packed my Great Great Grandmother's 10 inch skillet in my already overloaded suitcase, checked it at the airport, and brought it to St. Louis. The pan was in good shape, but it did need to be cleaned and seasoned. Cast iron is porous, and seasoning (or curing) is a process that fills these pores with fat, creating a rust-resistant, virtually non-stick surface. (See Living the Country Lifestyle All-in-One for Dummies ). When I started researching the care of cast iron online, I was shocked not only by the variety of opinions on the subject but also the zeal with which those opinions are advanced. Seriously. Cast iron appears to be a contentious topic for many people. The biggest debate seems to be whether seasoned cast iron should be washed with soap, detergent, or just water. Many commentators are concerned that the oil used for seasoning the cast iron will become rancid if the vessel isn't washed in soapy water. Others contend that soap will be detrimental to a carefully seasoned surface. 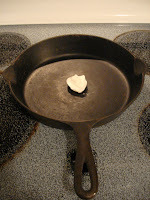 There is also some debate about the best type of fat to use for seasoning the cast iron. Based on the sources I read, here are the methods I decided on for the initial cleaning, seasoning, and continued care for my cast iron. Although the debate rages regarding the use of soap on cast iron that has already been seasoned, the sources pretty consistently state that cast iron should be scrubbed with soapy water BEFORE seasoning. 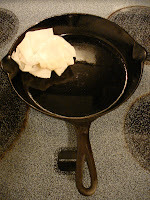 (See the Lodge website: http://www.lodgemfg.com/use-care-seasoned-cast-iron.asp). Most cast iron aficionados contend that this is the ONLY time that soap should touch the skillet. Although my skillet is older, you should know that new cast iron comes with a wax coating on it that should be removed before seasoning. So I scrubbed out my skillet with dish soap and a nylon brush. Then I dried it thoroughly with a dish towel (I remember my mother telling me, when I first started cooking, not to leave her skillet wet because it would rust.) Once the skillet was well washed and dried, it was time to season it. Commentators disagree about the best fat to use for curing cast iron. Some sources said vegetable oil should be used (America's Test Kitchen), others said vegetable oil can sometimes leave a sticky film. Some recommended coconut or palm oil. Others said good old lard or bacon grease, while some sources say animal fat is more likely to go rancid if you don't use your cast iron often. Lodge and Food Network's Alton Brown, both sources I consider trustworthy, recommend melted vegetable shortening. I preheated my oven to 325 degrees F, then put a generous teaspoonful of solid vegetable shortening in the bottom of the skillet. I set it in the oven, just to melt the shortening, then removed it using an oven mitt (the handle will be HOT, use caution). I used a wad of paper towels to thoroughly coat the inside of the skillet with the melted shortening. 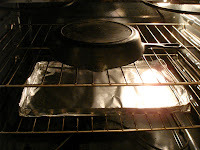 Using aluminum foil, I made a drip pan to catch any excess fat and placed it on the lower rack of my oven. Then I inverted the cast iron skillet on the upper rack with the bottom of the skillet facing the top of the oven. I baked it for an hour, then repeated the oiling and baking process (I did NOT rewash the skillet). The skillet may give off a slight burnt odor while baking, this is normal. After the second hour, I removed the skillet from the oven (don't forget the mitt) and allowed it to cool at room temperature. On to the divisive issue of cleaning seasoned cast iron after cooking in it. I decided to respect my elders and centuries of tradition: no soap. I've never been much of a germaphobe and maintaining the seasoned surface of the skillet to ensure good cooking is my number one priority. For cleaning, simply scrape off any bits of stuck on food (course salt mixed with a small amount of oil can be used as an abrasive for removing really stubborn food). Then rinse with hot water and dry thoroughly. Don't allow cast iron to sit in a sink full of dishwater. Also, don't airdry the cast iron, as this promotes rusting. Without fail, everything I read said that cast iron should NOT be washed in the dishwasher; it strips the seasoning, then allows water to sit on the unprotected surface. Also, the first few items cooked in the skillet after seasoning should be fatty foods (fried chicken, bacon, hamburgers). If, after time, the skillet begins to develop rust, foods stick heavily to the pan, or cooked items have a metallic taste, simply wash and reseason the cast iron. I'm so honored to be able to cook in something that belonged to my Great Great Grandmother, something that has a history. Unlike most cooking implements, which may retain sentimental value but become increasingly impractical as they age, this skillet has only gotten better with time. With proper care, this cast iron pan will probably outlast me and may belong to my grandchildren or great grandchildren. In the meantime, though, I look forward to using my skillet often. 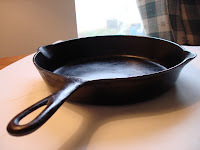 Don't be afraid to pick up well worn but sound cast iron (no cracks) at a yard sale or flea market. With a little care and attention you will have a cooking vessel to last a lifetime. Be creative and enjoy! I love using cast iron skillets but after cooking egg I can't get rid of the smell and it drives me to distraction. This is a problem with all pans (and eggs) but especially when I can't use soap or scrubbers. Any suggestions?